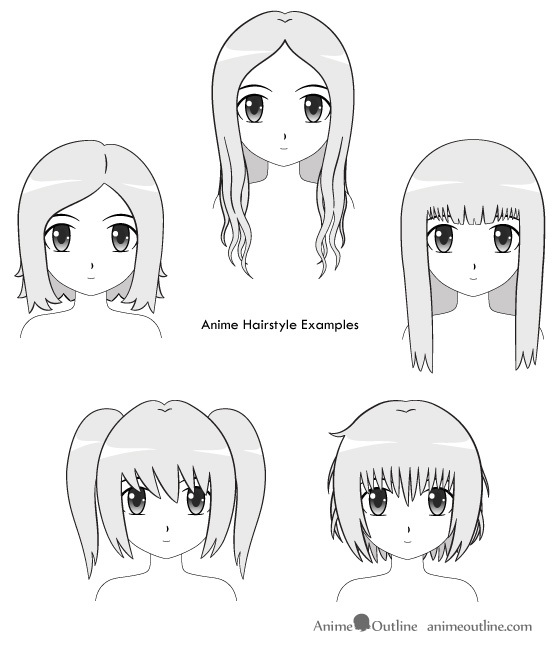 This tutorial illustrates how to draw anime and manga hair with twelve step by step drawings of common anime and manga hairstyles for a female character. 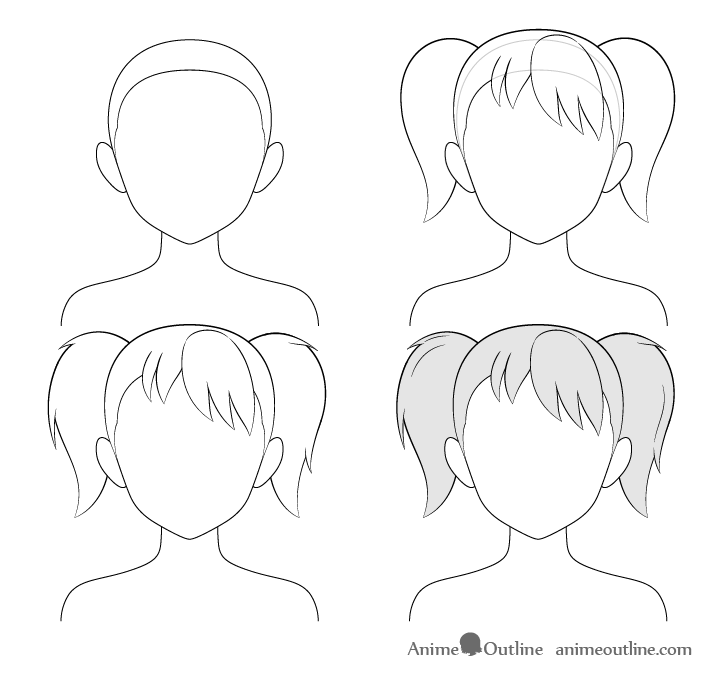 A good approach to drawing anime hair is to split it into several different parts such as the front, sides and back/top (as will be shown for each hairstyle below). 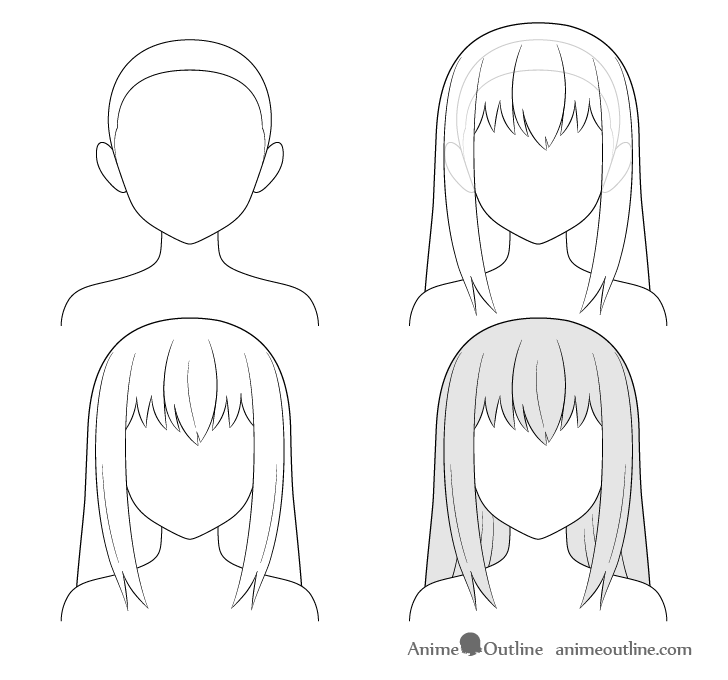 Long straight hair is probably one of the most common hairstyles in anime and is fairly easy to draw. 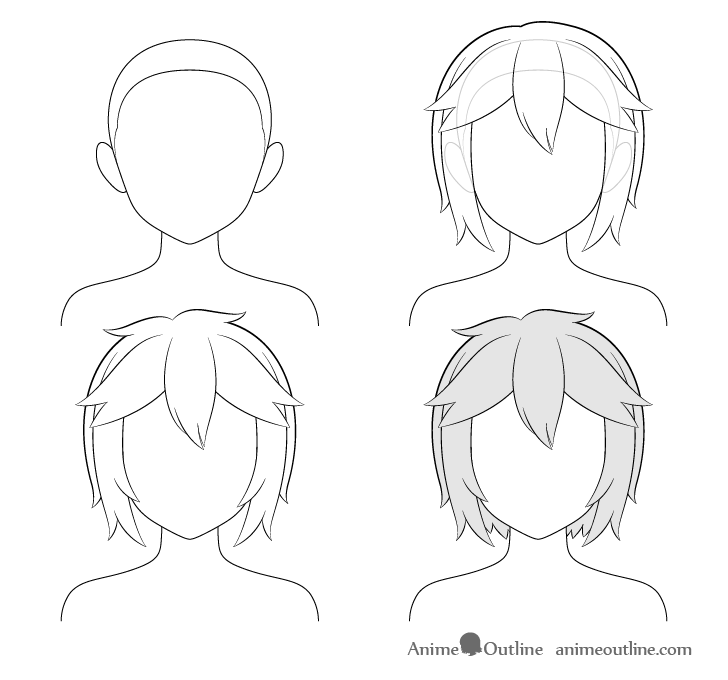 You can apply a similar breakdown to drawing other hairstyles as well. Thinking of the hair this way can make the drawing process a lot easier to manage. Keeping this in mind we can move on to the actual drawing process. Start by first making a drawing of the head and an indication of the hairline. While in this particular hairstyle the hairline is less important as it’s full covered by the hair it can still help you better judge the overall length and position of the front and side hair sections. Make the head/hairline drawing fairly light so you can easily erase parts of it later. 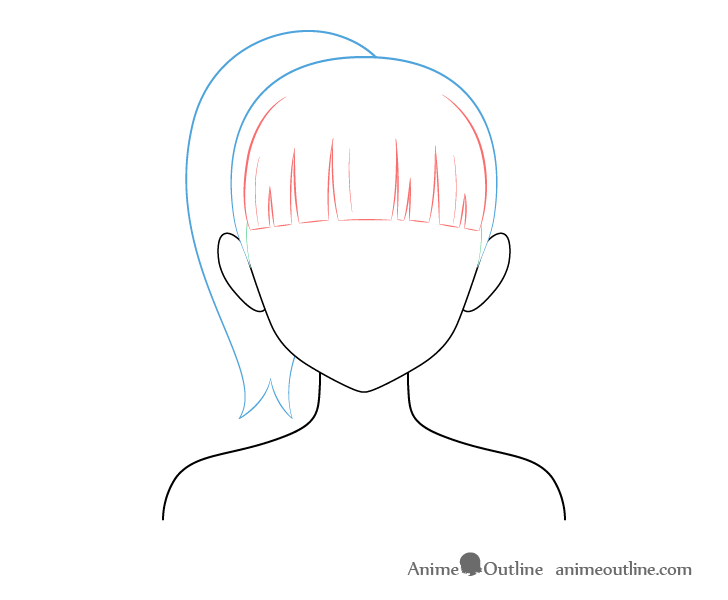 Draw the hair right over the top of the head and hairline as in the example above. For this particular hairstyle where the front section of the hair has been cut fairly short you can draw it in relatively small pointy clumps. Make the “side hair” fairly long with it’s overall shape slightly curved. You can also split it into several smaller clumps towards the ends. Draw the top part o the “back hair” pretty much following the shape of the head (a bit of a distance away from it) and then widening until it’s finally hidden behind the shoulders. 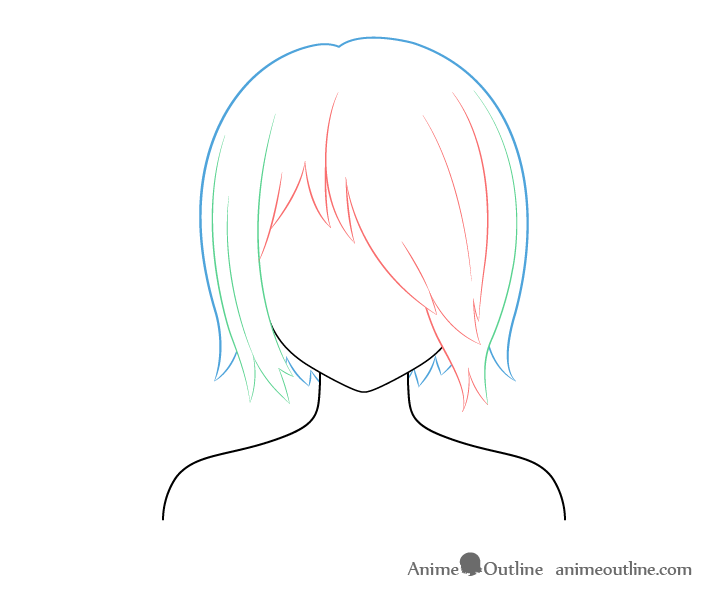 Erase the parts of the head hidden by the hair and add a few lines to show the inner folds of the front and back hair. You will generally want to position these folds in between the hair clumps as that is where these will usually tend to form in real hair. Next add some folds in the “back hair” to give a bit more definition of it’s shape as well so that it does not just look like a flat cut out. 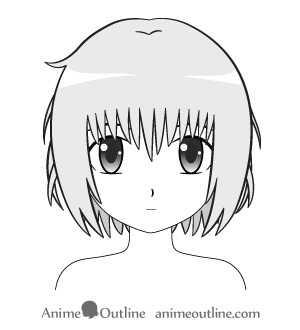 You can also add some basic shading to make the hair stand out a little bit more once you finish the line drawing. 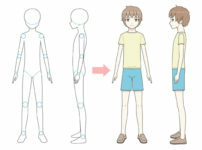 The short hair drawing example above is fairly similar to the long hair with the hair once again broken down into three basic parts of front, sides and back. Again start the short hair drawing with the head and hairline. Same as the previous example the hairline will not be as important here as it is in other hair styles but can still be helpful. Yet again very similar to the long hair draw the “front hair” section with a set of small clumps. For this particular example the hair will be a bit more messy so the clumps will curve more in different directions. 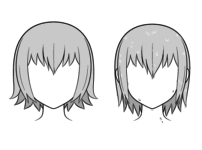 If you want neater looking hair you can draw them the same as the first example. Same as before erase any parts of the head hidden by the hair and draw the bottom portion of the back hair. Generally it’s a good idea to leave this section of the hair for the last part of the line drawing as in the front view of the head it will be in the back behind most of the other parts of the hair. If you try and draw it first you without the other hair to sort of “frame” its position you will probably end up with some overlapping lines and have to do extra erasing. Add the inner fords (just one in this example) and if you like, some basic shading. For trimmed hair draw the hair clump with flat ends that look like they’ve been cut off by sissors. For a neat look the different hair clumps should generally be drawn pointing in the same direction as the clumps next to them and any shifts in direction should be gradual. Start by drawing the hair and indicating the hairline. For the “Hime Cut” the hairline will again be covered by the hair. 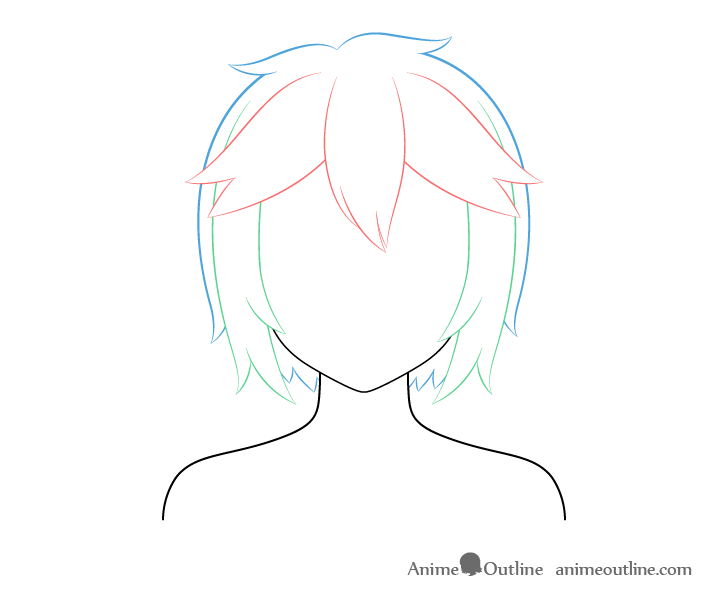 For the initial drawing of the actual hair you can start with the sides followed by the back. You can indicate the front section of the hair with just one line. Now draw in some small splits into the front and side parts of of the hair to make them look more natural. Erase the line in between the splits when you are done. You can also erase any parts of the head that are covered by the hair. 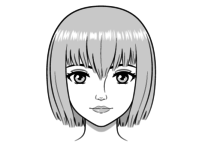 Finally again similar to the first example add some lines to the hair in the back to show it’s various inner folds. Try and draw these with fairly random spacing and slightly varying curves. If you space everything evenly and make all the curves trace one another too closely the hair will not look very natural. The long messy hair is somewhat similar to the first example but with some extra hair clumps. Again it can be divided up into three parts like all the other examples so far. As the other examples start by first drawing the head and hairline. Drawing the hairline will help you make sure that none of the splits between the hair clumps for the “front hair” go too far up. To make the hair look more messy draw the front hair clumps pointing into different directions and of varying shapes and curves. You can draw some that are wavy and some that juts curve in one direction. Draw the very middle portion of these clumps reaching further down. You can do the same with the outer clumps on the sides of the front section. This will again give more of an impression of hair that has not been well groomed. Now draw in some additional hair clumps randomly sticking out of the back sections of the hair. This will make the otherwise neat looking back hair look messy as well. You can also add a pair (or more) clumps to the inner parts of the “side hair”. You can either erase the outlines of the hair where you want to draw these or add them and erase the overlapping outline afterwards. Next you can add in some split lines in between the hair clumps same as some of the other examples. 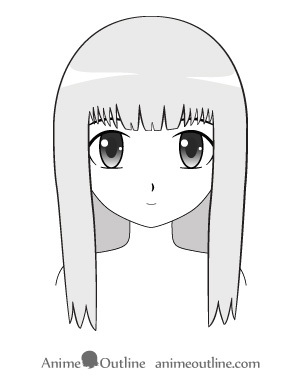 To finish the line drawing again erase the parts of the face and head that are covered by the hair afterwards. As this example also has long back hair you can again draw in some of it’s inner folds to make that section look more like actual hair. 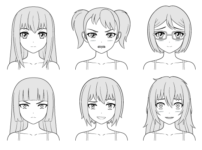 You can also make them a bit more wavy than the other examples to again make the hair look more messy. Another fairly common anime hairstyle is the ponytail. You will notice that there is basically no side hair in this particular example (other than the tiny bits of the hairline on the sides). So the hair can pretty much just be splits into the front and back sections. The back consisting of the hair over the top of the head and the pony tail. 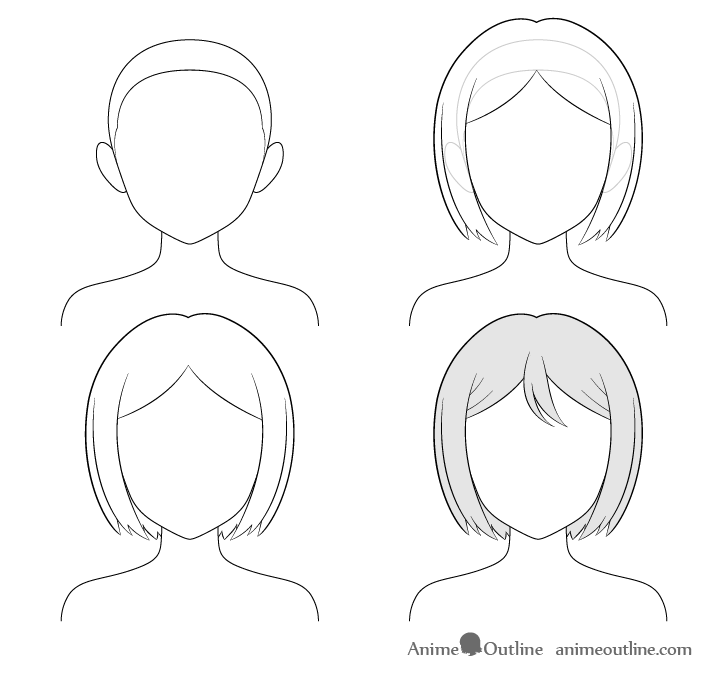 Draw the head and indicate the hairline which for this hairstyle is slightly more important than the previous examples as some of it will be visible in the final drawing as already shown. You can pretty much frame the front hair for this hairstyle with just three curves. Two for the sides and one for the bottom. As mentioned there is very little side hair in this example as the hair is pulled back revealing parts of the hairline. Draw the back hair just slightly over top of the head eventually merging into the sides. 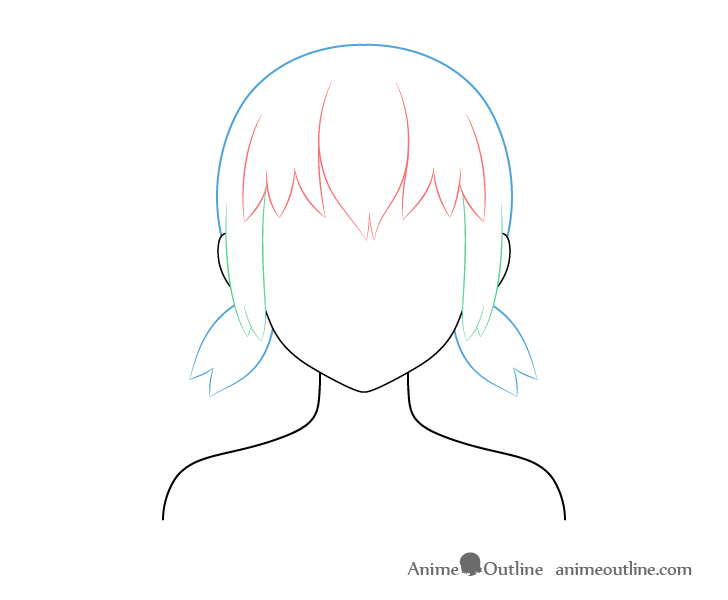 Though usually pony tails will face directly backwards for anime hair you can draw it slightly more to one side so that it’s shape is more visible. Otherwise the pony tail can just look like a bump on the head. You can draw the pony tail with a sort of question mark like shape. You can also add a small split at the end. 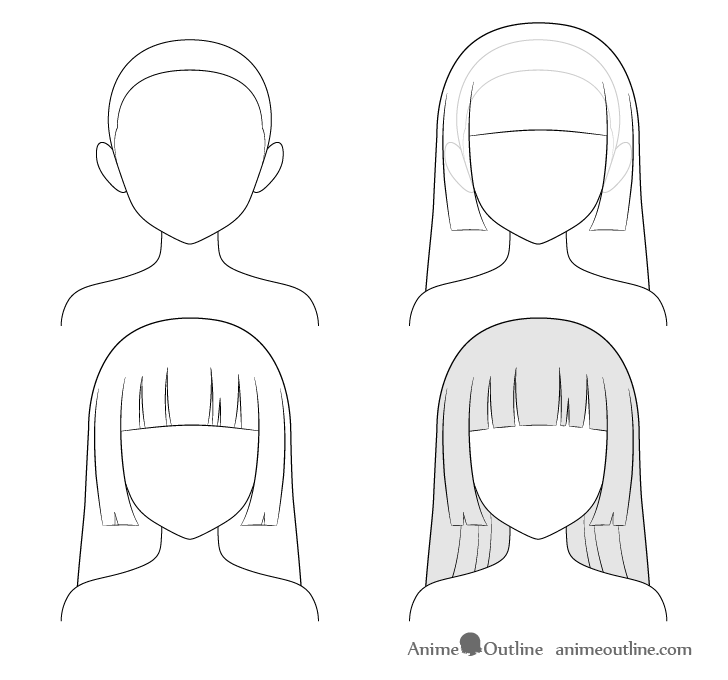 Same as for the “Hime Cut” draw in some small splits into the front section of the hair and erase parts of the bottom line of the “front hair” to make spaces in between them. Also erase the parts of the head hidden by the hair. You can again give the hair some light shading if you like. 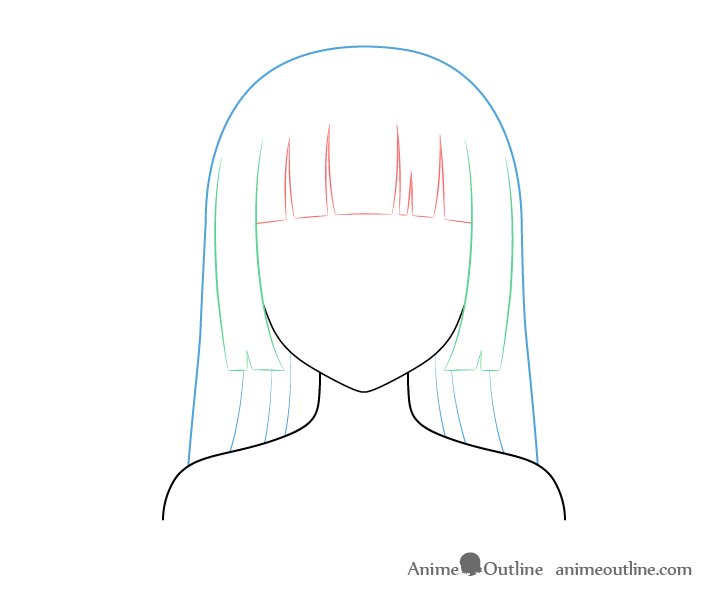 You can also optionally draw in a few more lines into the hair to make it look a little more split up than the “Hime Cut” which tends to have more dense “front hair”. For the hairstyle with hair over one eye you can yet again split the hair into the front, sides and back. In this style the front section of the hair will be fairly large and sort of merge into the “side hair” next to the covered eye. Draw the head and the hairline same as the other examples. 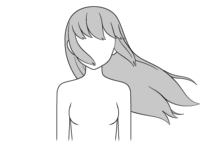 For this particular hairstyle draw the front hair clumps going far enough down the face to fully cover one eye. 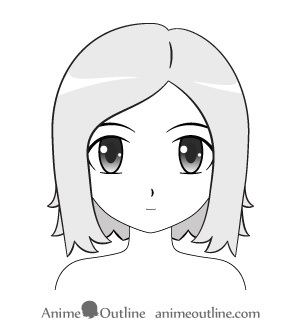 For the “side hair” you can draw the section on the side of the covered eye somewhat blending into the front hair. Draw the back hair split into tow curves that pretty much hug the shape of the head as they go down eventually sticking out in clumps to each side. For the very bottom section of the front hair draw a few small clumps sticking out around the top of the neck area. 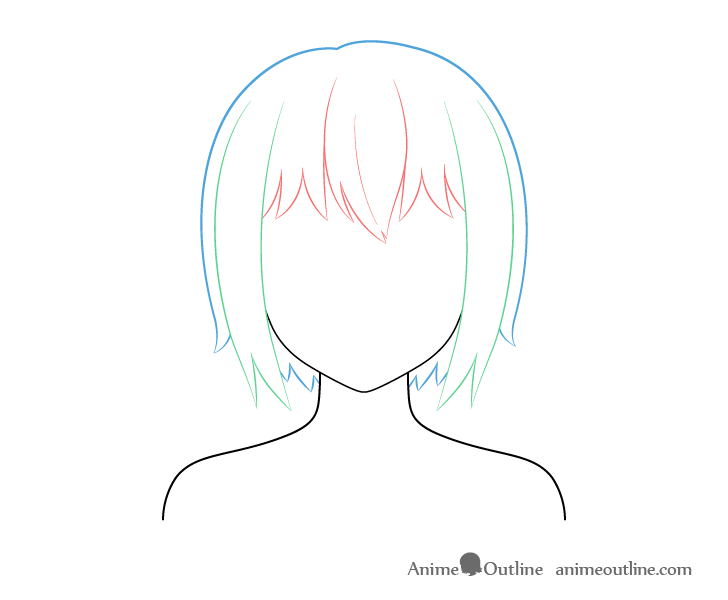 Erase any overlapping lines from the head that should be hidden by the hair when you are done. To wrap up the drawing you can again add a few lines to show some splits and curves of the hair going from between the hair clumps. The pigtails are another very common style of anime hair. 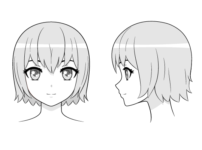 Same as the ponytail example you can see that this particular drawing can pretty much be broken down into the front and back section of the hair. With the “back hair” split into the hair covering the head and the pigtails. There are really only tiny bits of actual “side hair”. Draw the head and the hairline. In this example a large section of the hairline will be visible in the final drawing. It will also help us place the front section of the hair. 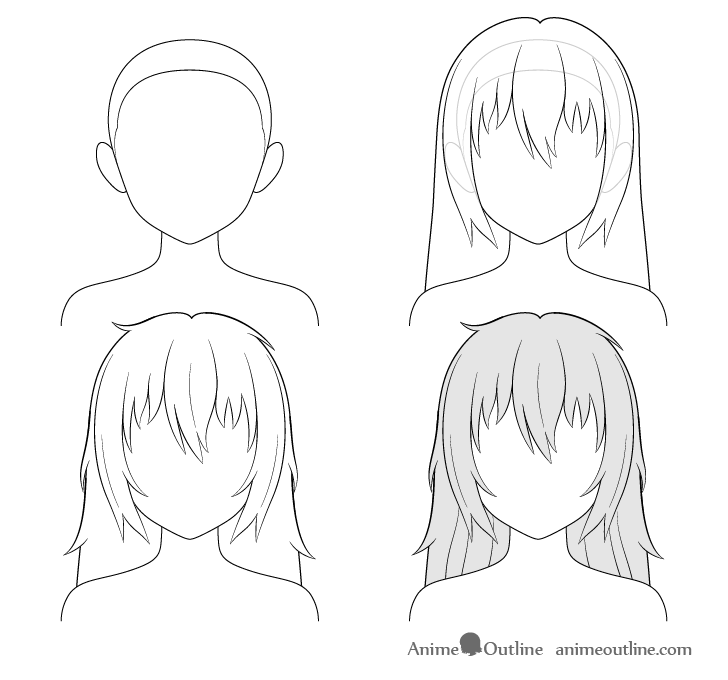 Though most of the hair in this particular example will be pulled back you can draw some clumps for the front section of the hair to just one side to make the hairstyle look a little bit more interesting. As already mentioned there will pretty much be no side hair other than the tiny bits around the top of the ears. Draw the top/back section of the hair blending into that side hair. 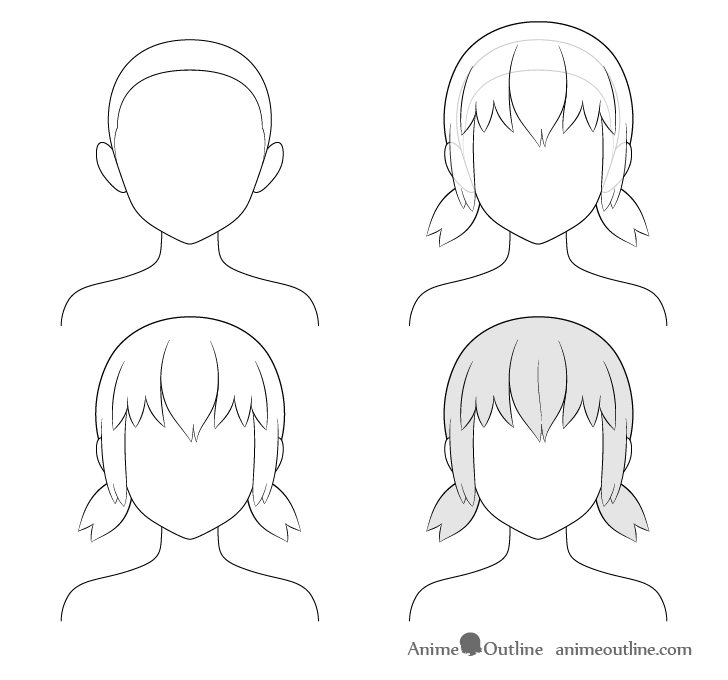 For the actual pigtails draw them similar to the “Ponytail” example vaguely resembling two questions marks in their overall shape with one being flipped over. 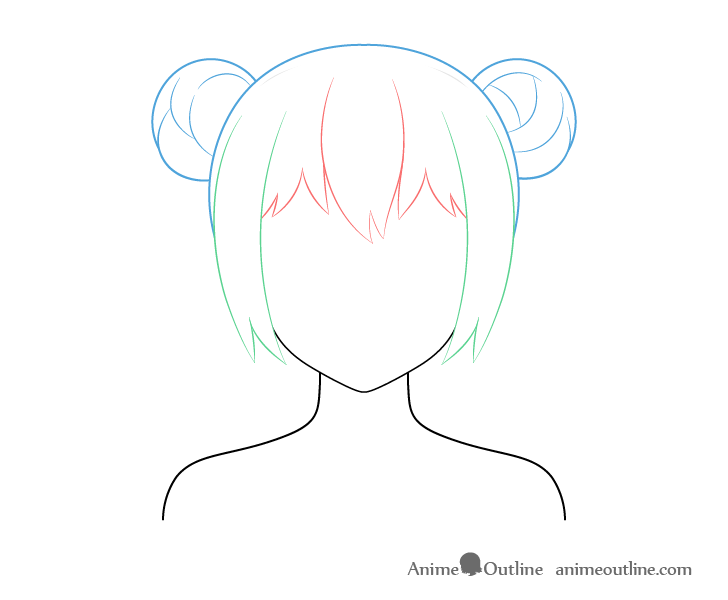 Now add some random hair clumps sticking out from the pigtails to make them look a little more interesting and erase any overlapping lines that this creates. Also erase the outline of the head where it’s hidden by the hair. 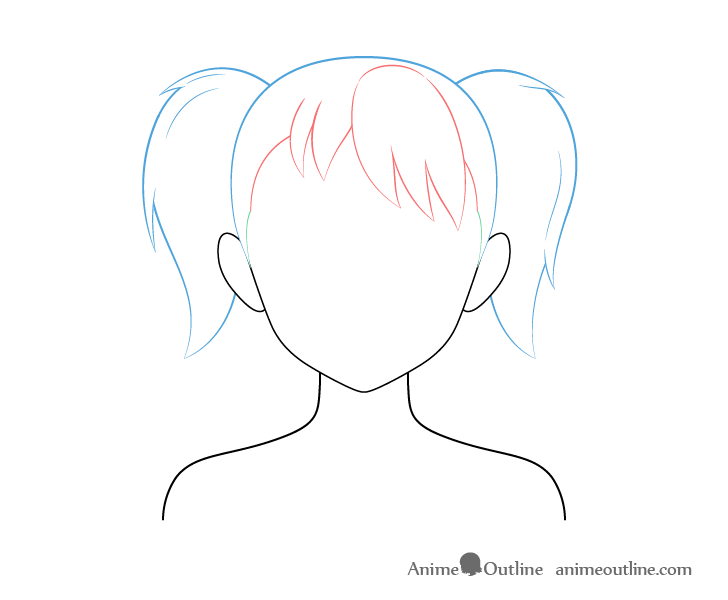 Add a few more lines to indicate some folds in the hair to the pigtails and optionally some shading. This hairstyle can again be split into three parts with the front, side and back hair. The front section of the hair however is a little different from the previous examples. Draw the head and hairline. The hairline in this example will be particularly useful for placing the front part of the hair. 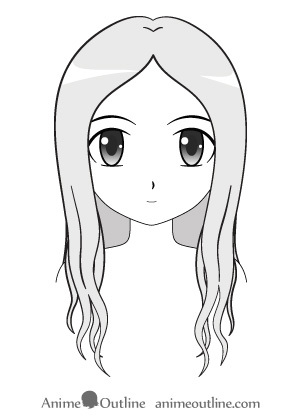 Draw the side sections of the hair with steady cures somewhat hugging the shape of the face. Roughly from the middle of the hairline draw two curves going downwards towards the “side hair”. This will be the “front hair” tucked underneath the sides which will be combed down over top of it. Draw the back hair with a fairly obvious split in the middle with two curves going in each direction. This will help show that the hair has sort of been neatly combed to each side. Add some small hair clumps for the bottom background hair. Finally you can add a little clump of hair hanging down from the middle of the front section of the hair. As sometimes the hair in that area will be to short to be tucked under the sides and part’s of it may hang down. This will make the hairstyle look a little more natural and interesting. Finally add some fold lines to the front sections of the hair going to the sides to help show that the hair is tucked underneath there. Curly hair is probably the most challenging anime hairstyles to draw. This particular hairstyle can again be split into the front sides and back with the front hair being similar to the previous example. Start the drawing the the head and hairline sketch. From the hairline draw two lines going towards the sides of the head to indicate the front hair. To show that the hair is curly you can draw these lines in light waves. The “side hair in this example will be completely curled. 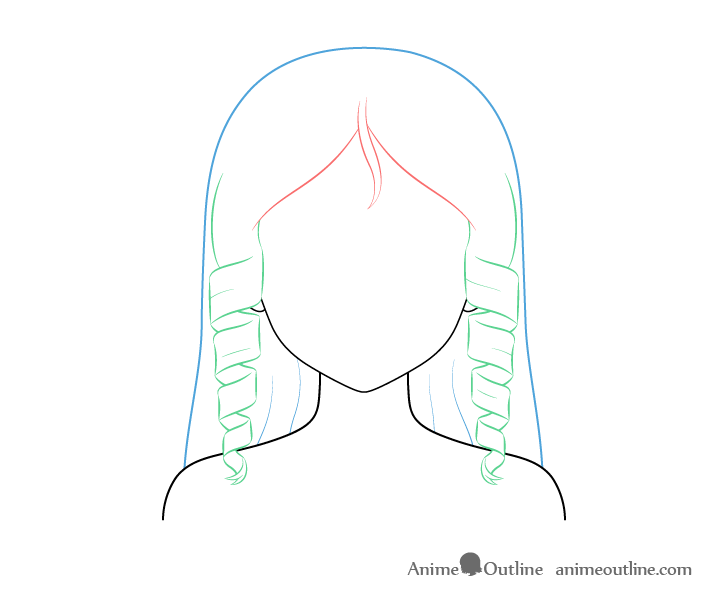 You can first draw some lines at the base of the curves to indicate the volume of the hair that will then transition into the sort of “spires” of hair below. To draw the actual curls first draw the parts of them that are in the foreground. You can sort of think of them as a cone that’s been sliced on an angle and pulled apart. Now erase any parts of the head hidden by the hair to avoid confusion and add the background lines of the hair curls. You can think of these as the front parts filled over. Finally you can draw some splits at the end of each curl. For the final step you can draw a little squiggle of hair hanging down from the middle of the front section and add some lines to the bottom of the background hair to indicate some inner folds. Make these lines more wavy than in the previous examples to show that the hair is curly. 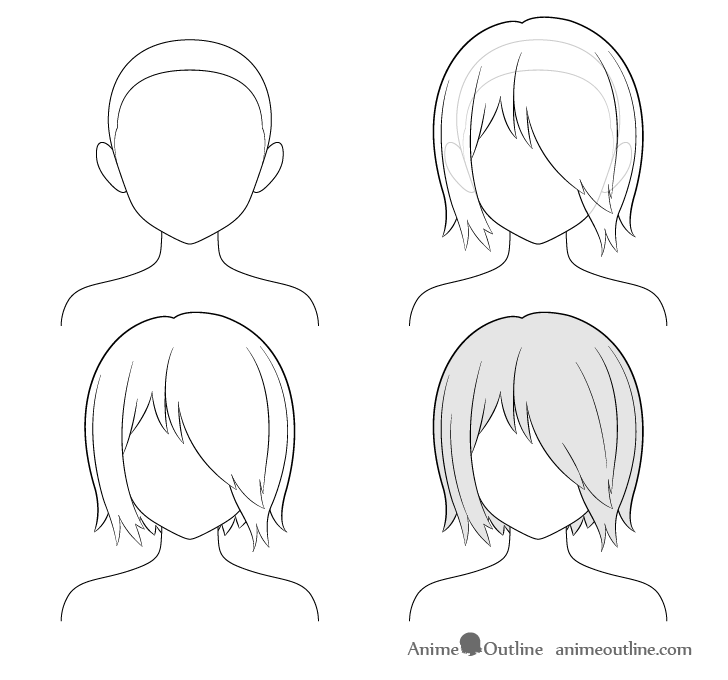 The hair bun’s are somewhat more rare but still popular style of anime hair. This style can also be split into the front, side and back hair. Once again start the drawing with the head and hairline. Draw the “front hair” in small clumps pointing towards the middle of the face and the sides same as most of the other examples. Draw the “side hair” with light curves somewhat “hugging” the face. Make the “back hair” pretty much curve around the shape of the head. 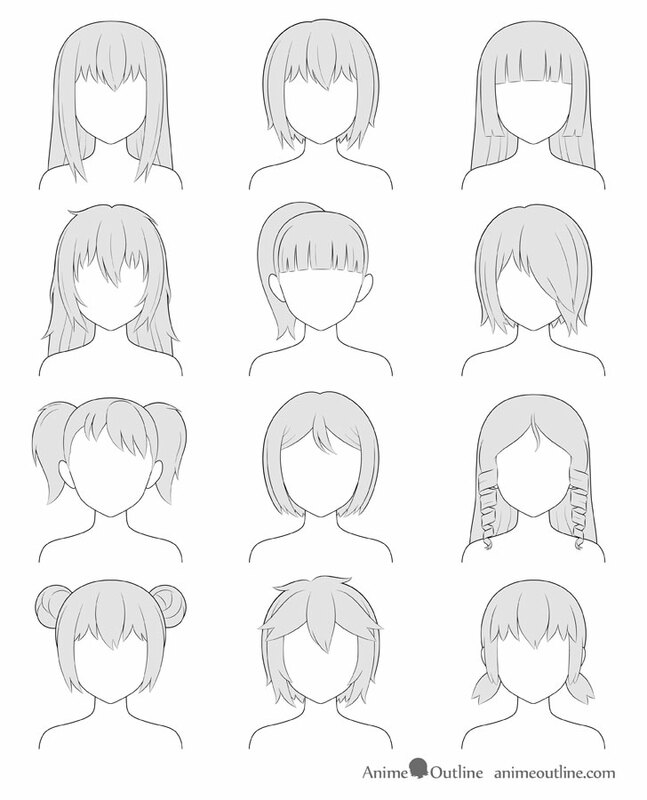 Finally draw the actual hair buns with somewhat of an oval shape for each with part of it hidden behind the “back hair”. Draw some o the inner curves of the hair bun. You can pretty much draw these at random but try and somewhat follow the outer curve of the bun with at least a few lines. This will help create that sort of “ball of yarn” look that hair buns tend to have. The short messy hair is again easy to split into the front, side, and back sections. 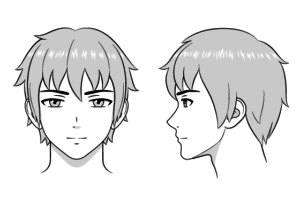 Same as other examples draw the head and hairline to start. 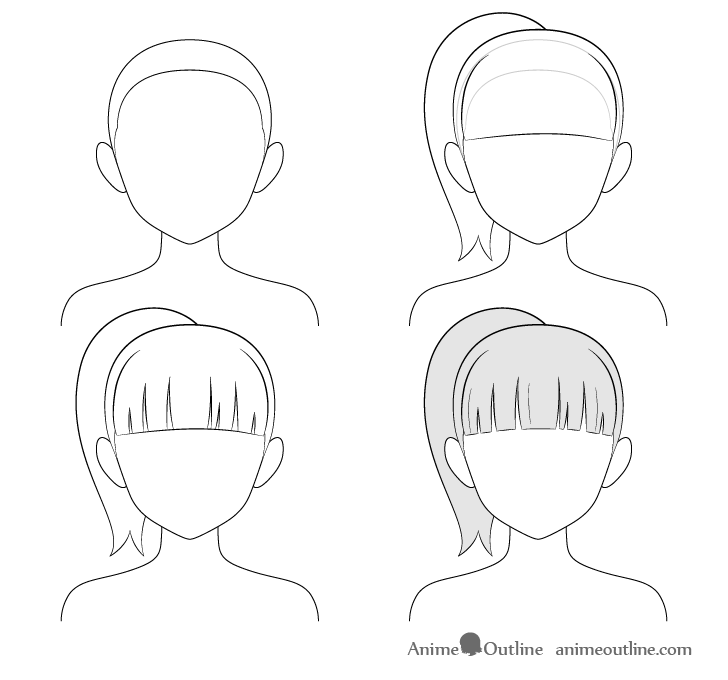 Draw the front section of the hair with the outer clumps sticking out to the sides instead of resting on the forehead like most other examples. Add the side sections with the splits at the ends sticking out in opposite directions. Draw the background hair with a slightly split to one side and the two curves that come out of it eventually transitioning into hair clumps on each side of the head. Now add a pair of wavy clumps to the upper split are of the background hair and another pair of clumps to the inner areas of the “side hair”. Erase the parts of the hair where you add the clumps and erase any parts of the head/face lines covered by the hair. 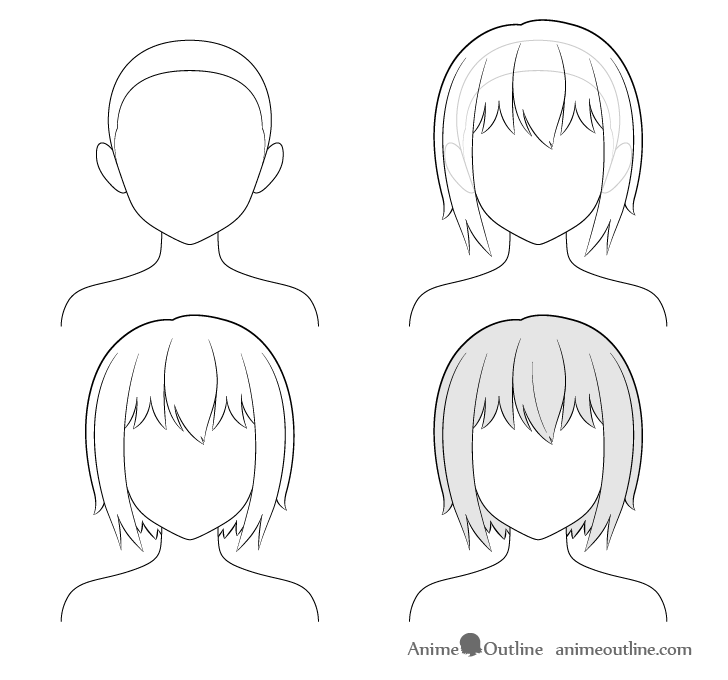 Add the bottom portion of the background hair drawing in small clumps pretty much the same as the other shorter hair examples in this tutorial. 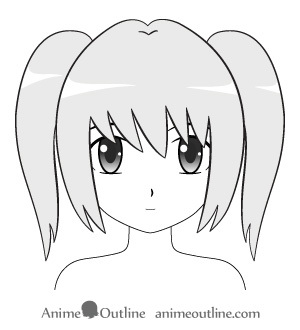 For the final example of anime hair in this tutorial we have the short/low pigtails. 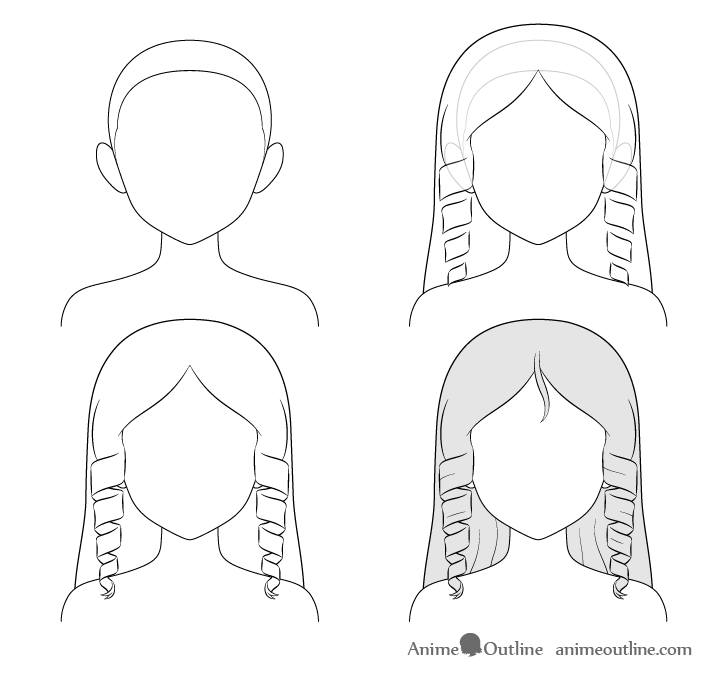 As most other examples in this tutorial these can again be split into the sides, front and back/top hair. Start by drawing the head and hairline as all the other examples. Add the front section of the hair first as in this example it will be sticking out a little more to the sides overlapping the side sections. Draw the “front hair splitting into fairly small clumps and do the same for the ends of the “side hair”. Make the “back hair” pretty much following the shape of the head. Finally add the pigtails at the bottom of the head with small splits at their ends. Clean up the drawing by erasing the parts of the head hidden by the hair. Add some lines to show the heads inner curves and fold. In this case just one for the front hair clump. Hair highlights can really make hair stand out even without any additional complex shading and are fairly easy to add. 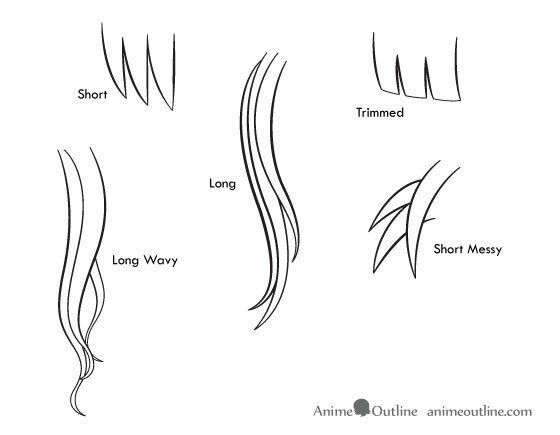 When drawing hair it can be very helpful to organize it into separate sections. 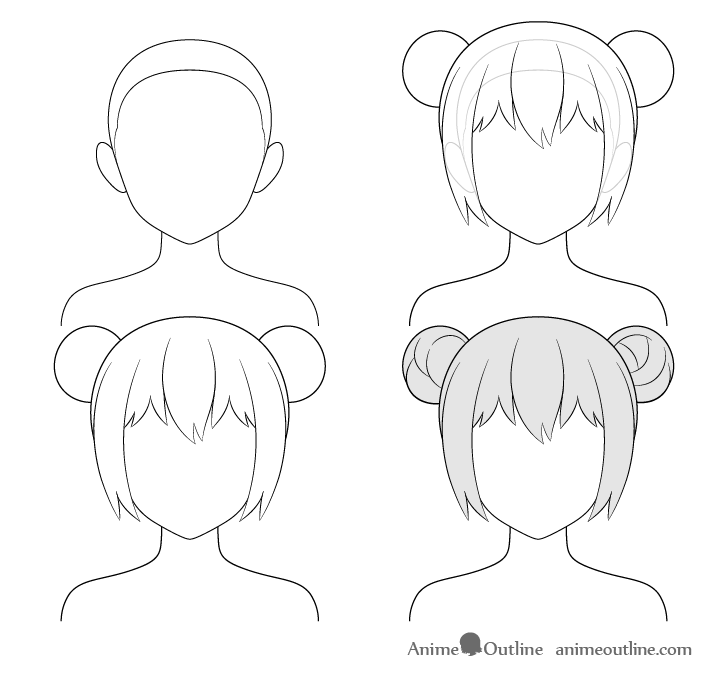 Not only will this help you get a better grip on how to draw it but it will also allow you to more easily alter the hairstyle by changing its various parts. For more hairstyles you can experiment by mixing different parts of the front, side, and back sections of the hair in this tutorial or by adding entirely new designs. This tutorial has been almost completely redone and updated with new art but you can see the old examples below.